Sciton Halo – I am excited to announce we have recently purchased a new laser providing a new treatment option for our people. The treatment is capable of helping us continue to win the war on aging. The Halo is a new technology currently only offered by one company, Sciton. It is a resurfacing technology that combines a hybrid of ablative and a non-ablative treatment in a fractional form to provide exceptional results with very minimal downtime. If you did not understand a word of the last sentence, do not worry, I’ll explain. The technology has been available for approximately 2 years but because of the cost, I could not justify the purchase, until now. Most laser treatments aimed at improving the appearance of skin do so by slightly damaging the skin in order to force the skin to shift into a repair phase. Once in this repair phase your body starts to produce collagen and elastin in large amounts. Collagen and elastin are two of the most important components of skin when it comes to keeping your skin looking youthful, plump and wrinkle-free. Before the Halo our options for improving skin involved varying amounts of ablative and non-ablative treatments. Ablative means actually destroying the most superficial layers of the skin and non-ablative meaning heating (but not destroying) the skin. The amount of improvement one would receive often dictated how much down-time they had. In other words, if a person could take 2 weeks off work and another 3 weeks out of the sun, I could do a fully ablative treatment and shave a decade or two off of their skin appearance. Most people are not able to take the time off required to get this treatment. With the Halo, we can produce closer to fully ablative results with a weekend of downtime, much less pain and much less risk. The Halo’s hybrid technology works by placing a microscopic hole (ablative) in the skin using one laser wavelength followed almost simultaneously by a non-ablative pulse using a different wavelength placed directly into the same hole. I use the term “hole” to help illustrate what is happening but remember these “holes” are microscopic and do not penetrate all the way through the skin. This technology is truly a game-changer in the skin care industry. Please see the following pictures to understand the results. From a laser standpoint, BBL and Halo will now become staples in our fight to help our people maintain a youthful appearance. Please call us with questions or to book your treatment. 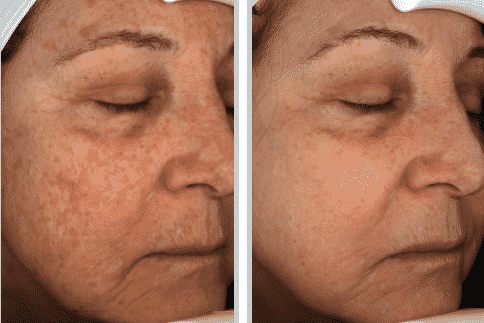 In the below before-and-after pictures, notice the overall improvement in fine lines, discoloration, sun spots and skin texture. Remember, you are able to wear make-up at 24 hours. You could do this treatment on Friday and go to work the next day and have normal skin in 5-7 days. Call 972.691.7900 or click here to schedule an appointment to see if Sciton Halo is right for you. You can also find more information about Flower Mound Plastic Surgery on Facebook.com.